Krystal Griffith obtained her Bachelor’s of Science in Natural Science from Loyola Marymount University in 2010. After obtaining her undergraduate degree she worked as a research assistant for almost three years in the Geriatrics department at the University of California, Los Angeles (UCLA). During her time as a research assistant, Ms. Griffith worked on a number of studies including the Multi-Ethnic Study of Atherosclerosis (MESA-Stress Study), Study of Family Health, and Midlife Development in the United States (MIDUS). In 2013 Ms. Griffith left her position at UCLA to work towards obtaining her Master’s in Public Health in Health Promotion Disease Prevention at California State University Fullerton, which she earned in 2015. While completing her graduate degree Ms. Griffith worked as a graduate research assistant for Dr. Lilia Espinoza, as well as a clinical research coordinator for Southern California Oncology Research Alliance (SCORA). 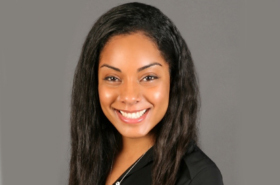 Currently, Ms. Griffith is a research assistant for the Community Partners in Care (CPIC) project as well as the project manager for the Community and Patient Partnered Research Network (CPPRN) at the UCLA Center for Health Services and Society. The Community and Patient Partnered Research Network (CPPRN) is a new project in Los Angeles County and New Orleans that seeks to improve behavioral health services for under-resourced communities. CPPRN is a part of PCORnet, an innovative initiative of the Patient-Centered Outcomes Research Institute (PCORI). PCORnet will transform clinical research by engaging patients, care providers and health systems in partnerships that leverage health data to advance medical knowledge and improve health care. PCORnet is a national health data network will allow us to explore the questions about conditions, care and outcomes that matter most to patients and their families. A community-patient partnered intervention tailored to meet the mental health needs of LGBTQ persons. This comparative effectiveness study seeks to find the added value of a 7-session Cognitive Behavioral Therapy-based class taught by non-licensed professionals in community settings compared to standard treatment of depressed LGBTQ individuals.